Reusable containers to hold bulk ingredients makes mise en place (schmancy culinary term for setting out all your sh*t before you cook it) look really nice. It’s nice to look at and it just makes you feel nice. Some things are more expensive in bulk or without packaging. Most things are not. There’s a learning curve when filling your own container with cashew butter. We left the bulk aisle with a “full” jar but by checkout was left with a sad little inch. It settles. Know we know. I’m on the hunt for bulk dog food next. Our current dog food (Bench & Field, from Trader Joe’s) comes in a plastic bag that as far as I currently know cannot be recycled. I’ve reached out to the company for comment. I already feel guilty knowing that the two cases of Lara bars that are still in my pantry will contribute to my trash. I need to stop that. Progress not perfection, Meredith! Speaking of not being perfect, my formerly expert grocery shopping husband is feeling a bit out of his element. Except at the meat counter and butcher, where he gladly orders #allofthemeat. In other news: we’re glad to be living in Vermont with access to such great stores and products. But still so much healthy, local, humane-raised, grass fed deliciousness is packaged in plastic. Farmer’s market is back this weekend and will hopefully yield (or open doors to) even more good stuff sans packaging. Most of the plastic in our trash bin right now is from products we purchased before committing to zero waste and we’re just finishing them and disposing of them now. We will definitely have more than a jar of waste this month! I wanted some crackers so I MADE CRACKERS. While holding my teething/fussy 13 month old most of the time, too. It was easy (no thanks to the baby) and glorious and they tasted damn delicious. And then I put them in a glass container in my pantry and felt like a boss. Small wins for the win. Thank you, dear sweet Elana. This article is supposed to be about children but it’s making me think a lot about restrictions leading the way for pleasure. More on this later. My daughter loves bananas. Bananas have all the stickers, all the time. Why, bananas, WHY?! Chipotle won’t let you bring your own containers. I asked corporate very nicely but they still said no. I’m guessing this is due to a health code yadda yadda. But we got Chipotle anyway this week because I was sick (ouch) and I really wanted it. Not zero waste exactly, but we asked them to put everything in the compostable container bottoms and then stuck those in our own glass containers and took the food home. Where I promptly washed out those “disposable” compostable containers to use some other time. They are light and could easily be tossed into a bag for a picnic or camping. 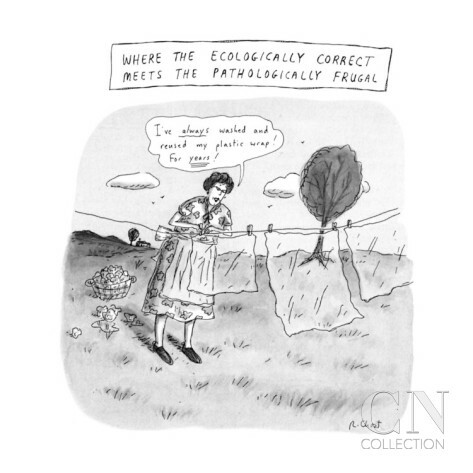 I am all of a sudden a version of my mother, who famously didn’t get the joke in this Roz Chast cartoon: That’s all for now! Check me out on Instagram for daily insights. And baby (and dog) pictures. Hooray! Sounds like it’s going so well. Progress not perfection, for sure. Hope you’re feeling better!